← NACCHO Aboriginal Health #Election2019 : A Labor Government will become the first political party to put in place a #RAP #ReconciliationActionPlan – and commits to us having a #voice in the party, in our parliament, and in our society. 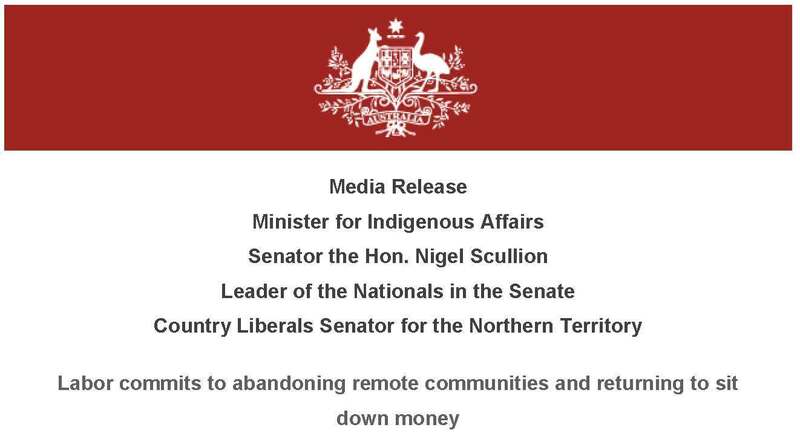 ” We welcome Labor’s focus on creating jobs and meeting the needs of remote communities, and its commitment to abolishing the existing program, which is harmful and discriminatory. We are urging that the new program includes a firm funding commitment to support the creation of a substantial jobs package – this is vital for remote communities. We welcome Labor’s commitment to work with First Nations people to co-design a new program and their recognition that our communities must be involved in decisions about policies that affect us. “ Today’s revelations that the Labor Party will cut over $1 billion from the Indigenous Affairs portfolio and abolish the Community Development Program is an astonishing admission that Labor has no plans to improve life outcomes for Aboriginal and Torres Strait Islander Australia. Senator Dodson announced Labor would abolish the CDP, a program unions and welfare groups have argued is “blatantly discriminatory” because 83% of its 35,000 participants are Indigenous, and it imposes higher requirements than the work for the dole scheme does. As a condition of income support, remote-area participants must engage in up to 25 hours of work activities a week. Dodson said Labor would replace the CDP with a new program to be “co-designed” with First Nations people and restore the principle of “community control and direction”. Aboriginal Peak Organisations NT (APO NT) has welcomed the Australian Labor Party’s commitment to abolish the Government’s discriminatory ‘work for the dole’ program in remote communities. In announcing the Labor Party’s commitment to scrapping the Community Development Program (CDP), Senator Pat Dodson said that it would be replaced with a new program that ‘creates jobs, meets community needs and delivers meaningful training and economic development’. Dr Josie Douglas, Policy Manager at the Central Land Council warned that income inequality between remote communities and urban cities is growing. “Aboriginal people have the solutions. We have developed a new model – the Fair Work and Strong Communities model – which would immediately reduce poverty in remote communities by 2.6% and cut the gap in employment rates between remote Aboriginal people and the rest of Australia by one third,” said Dr Douglas. “This approach has the broad support of key Aboriginal organisations and national bodies. “By listening to us and adopting our proposal, Labor could make an immediate difference to thousands of people and provide a platform for economic, social and cultural development in remote communities,” said Dr Douglas.  Funding packages for the creation of 10,500 jobs. Packages cover 20 hours at minimum wage plus on-costs, which may be topped up by an employer.  1,500 paid, six-month work experience places for young people.  Repurposing the existing $25m entrepreneurship fund to support social enterprise development.  Indigenous control is embedded at the national, regional and local level. The program is managed by a national, Indigenous led body.  Within broad program goals (like increased employment rates) local communities have significant input into local targets and scope to vary ‘default’ policies in relation to level of obligations and penalties.  Program orientation changes from short-term results to achieving net impact through, over time, the creation of sustainable new jobs and skilling local people to take up jobs already in communities.  Financial incentives to penalise participants are removed.  People with substantial long-term health issues and/or disabilities are assigned to a stream in which they are supported to participate voluntarily, but not compelled. The current CDP costs over $300m per year (excludes income support costs). Net cost of the Fair Work Strong Communities jobs package (12,000 new jobs) = $195.8m per annum. However, this amount would be significantly decreased by potential offsets from current program costs. Today’s revelations that the Labor Party will cut over $1 billion from the Indigenous Affairs portfolio and abolish the Community Development Program is an astonishing admission that Labor has no plans to improve life outcomes for Aboriginal and Torres Strait Islander Australia. The Community Development Program is the continuation of almost 40 years of remote employment services and is a critical part of Government’s work in remote communities to engage adults in work and improve the circumstances of remote communities. The CDP has turned around community engagement and participation – from only 7 per cent at the end of Labor’s Remote Jobs and Communities Program to over 70 per cent today. Change hours of participation from a maximum of 25 hours per week to up to 20 hours per week. Improved job seeker assessments, with local health workers able to provide the medical evidence required to review mutual obligation requirements. Labor’s shocking lack of detail on this policy leaves a lot of uncertainty for residents of remote Australia. Will the Labor Party introduce the mainstream jobactive program into remote Australia despite clear calls from Indigenous leaders and communities for the need for a program that is tailored to the needs of remote job seekers? Will the Labor Party abandon the principle of mutual obligations and return communities to the misery of sit down money and passive welfare that fails children, women and families and causes dropping school attendance and community safety outcomes? Who has the Labor Party consulted with in making this decision? Has the Labor Party asked representative bodies and local Aboriginal CDP providers? Has the Labor Party asked residents of remote communities? Or has the Labor Party just made its decision based on the views of east coast academics and its union masters. The Labor Party needs to come clean on its plans for remote Australia.